It was pointed out on a forum I participate in that while I am advocating conservation and energy independence, we live in a vehicle that is not all that fuel effecient. 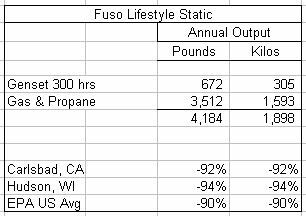 I took that as a valid observation and decided to compare our current and previous lifestyles in the current energy lifestyle metric: carbon dioxide (CO2) emissions. I’m not caught up in the wave of greenery, and I most often view it as a positive trend that can finally move America towards my ultimate and primary goal: energy independence. Nonetheless, if you’re going to talk energy today, then you must use the popular lexicon and denominate yourself and your transactions in the coin of the realm, which in this case is definately CO2. We didn’t set out on this travel with any kind of environmental mission, carbon dioxide demonstration project or anything of the sort. But, I’d be lying if I didn’t admit that one of our big goals was to simplify our life and learn about the realities of living off the grid, in anticipation of our next chapter. But, in terms of lifestyle, we are not making any concessions or compromises. We continue to live a very electron-rich lifestyle, and our accommodations are like living in a Hyatt in the woods. No complaints. In that regard, we did not set out to wear hair shirts and shout from the mountaintops about the debauched lifestyles of those who live a more conventional lifestyle. Our goal was to see what the off-the-grid life was like while living a pretty comfortable life surrounded by any systems we thought we needed. So, off we go on our journey to determine the size of the Hackney Fuso expedition vehicle lifestyle carbon dioxide footprint. Our expedition vehicle did require resources and energy to create, fabricate and construct. The camper shell is fiberglass with an injected foam interior layer. Wood, wood and fiber laminates and fabrics are used in the camper interior. Surprisingly, there is minimal use of plastic in the camper. Most of the rest of the vehicle construction is steel and aluminum. I honestly don’t know how those materials and energy inputs compare with the average American home in terms of resources, energy, etc. required to construct it. We use solar to generate electricity. We do not have a wind turbine, but do produce 12VDC electricity to recharge the batteries and run the electrical systems via parasitic drag on the chassis motor while moving. We also have a very efficient diesel generator for those times when we need it. We can draw on external sources of electricity (120V60hz or 220V50-60hz), but we are very rarely plugged into external power. We can do all of our primary energy needs via electricity (cooking, heating, purifying & sterilizing water, etc.). Our primary external source of energy is diesel. We use it to power the vehicle and to run the diesel generator. The generator uses 1/10th of a gallon / 38/100 liters per hour and we’ve run it about 300 hours in 1.5 years. The vehicle itself gets ~10 m.p.g. / 4.24 kilometers per liter / 23.63 liters per 100 kilometers. We’ve used about 2,338 gallons / 8,851 liters of diesel fuel since we left 4 June 2007. I think we’ve probably used about 250 gallons of propane in that time. Our primary use for propane is cooking, although we have used the propane furnace extensively while in cold regions of Patagonia and the Andes. The dirt bikes are very fuel efficient, so I will allow 50 gallons of gas for them. That’s probably generous. The EPA states that the average American household outputs 41,500 lbs / 18,824 kilos of CO2 per year. 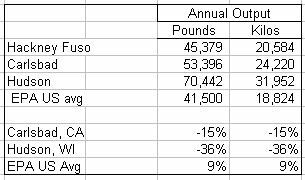 I used the calculator on our previous lifestyle living in Carlsbad, CA and it produced an estimate of 53,396 lbs / 24,220 kilos of CO2 a year. That was just our trio of four wheeled vehicles and our home. The calculator doesn’t include a way to calculate for motorcycles, so they are not included. But, even so, it’s probably a close enough estimate to give us an idea of the contrast between then and now. Note that the EPA calculator uses your zip code to calculate heating CO2. Since we lived in probably the most moderate climate in the U.S.A., others who live in colder regions using similar amounts of energy would have a higher CO2 load. 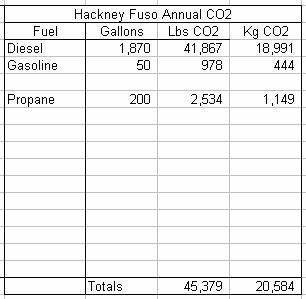 Using our old zip code for Hudson, WI, the CO2 load was 70,442 lbs / 31,952 kilos of CO2 a year. We’re obviously not going to win any medals compared to the EPA average U.S. home. On the other hand, we’re doing better than either of our last two homes, we’re seeing the planet and we’re gaining valuable experience about the realities of a life lived off the grid, in which you are responsible for managing, if not creating, all of your own energy. During the year of this sample, we’ve covered about 20,000 miles. If your vehicles average 20 MPG and you’ve driven 40,000 total miles in them, your vehicle CO2 about matches ours. If your vehicles average about 10 MPG and you’ve driven about 20,000 miles, again, your CO2 about matches ours. As you can see, the vast majority of our CO2 footprint comes from moving our truck around the planet. When we are parked, our annual CO2 footprint is a lot smaller. Viewed in this perspective, we’re doing pretty good. At the same time, we are not at all interested in making buttons or t-shirts with our carbon footprint emblazoned on them and strutting smugly about among the great unwashed masses. This is the first time I’ve ever calculated it. I’m not a CO2 or carbon footprint zealot. Frankly, I find those zealots as devoid of rational thought and critical thinking as any other zealot. I do, however, think it is a serious issue when the carbon dioxide level in the atmosphere has increased from 280 parts per million (ppm) to380 ppm.That’s worth some attention, if for no other reason than for the acidification of the oceans it drives. But for me, if a focus on reduced CO2 takes us towards the goal of energy independence, then it’s a good thing. I’ll play ball with anyone who moves us towards that goal. Even CO2 zealots. This entry was posted in 2009, Expedition Vehicles, Sci / Tech, Timeline, Travel. Bookmark the permalink. Really interesting stuff, thanks for posting this. A friend sent me this link, I wasn’t a regular follower of your blog so sorry if my comments belie that I am not familiar with your project. Firstly, how many people is your household (and now bushold)? I’m guessing it’s 2. Throughout the developed world we typically emit around 10 tonnes of carbon per person. In practice your life on the road probably has a lot less of these things, and I don’t know how significant a factor that would be, but the CO2 calculate you’ve done for life on the road doesn’t include anything for it. Also have you thought about the carbon footprint of creating the vehicle spread over it’s total used lifetime. I wonder how this compares to a house. There’s a lot of energy and materials used to construct a house, but it is then used almost everyday for 80 years. A typical camper van has a lifespan of 15 years say, but is only used for about 4 weeks a year. Just food for thought. I really enjoyed this posting.